Adventurous Tastes: The Best Pancakes You Will Ever Eat! The Best Pancakes You Will Ever Eat! Anyone who has ever lived in New York City knows that Clinton St. Baking Company makes the best pancakes EVER. I've waxed poetic on these little miracles before (read here). Now thanks to the Clinton St. Baking Company Cookbook, we can enjoy the experience minus the expensive flight and 2 hour wait in the cold. You can find the pancake recipe we used here. 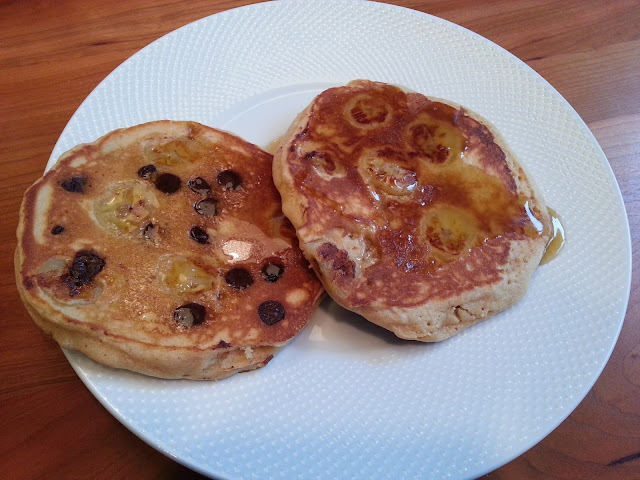 The recipe is for blueberry pancakes, but adding banana is where it's at. The secret to these pancakes is folding in egg whites, so they are oh so fluffy. I also love how the banana goes all ooey gooey and makes for a wonderful creamy flapjack! As you can see from the pic below, the Mr. went extra decadent and added some chocolate chips to some of them as well. To get the full experience, you also have to make the maple butter, which is essentially liquid crack. It's simple to make - it's just a combo of tons of butter and grade B maple syrup. Find the recipe here. And great googly moogly is this stuff good. It puts plain syrup to shame and takes these already top notch pancakes to another level. 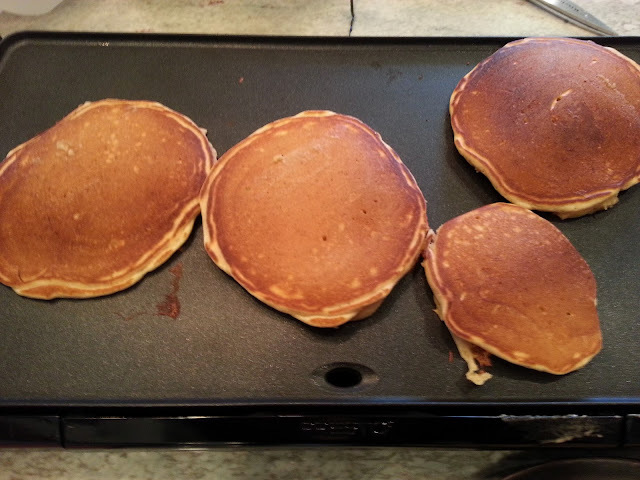 A couple of tips - first make sure your griddle gets hot enough, otherwise your first pancake will be a stinker. Also some good advice I picked up from Tyler Florence at a demo years ago is to rub butter on the griddle with a napkin once it's hot to get just enough of a light coating and ensure that the butter doesn't burn. We made more batter than we needed and saved it to use another day. These are total bliss, so don't miss out! Buy your copy of the Clinton St. Baking Company Cookbook here.